Auckland’s Nien-Tzu Chen is currently in Japan, supporting Swissport’s Haneda Airport team with the launch of Hawaiian Airlines services. 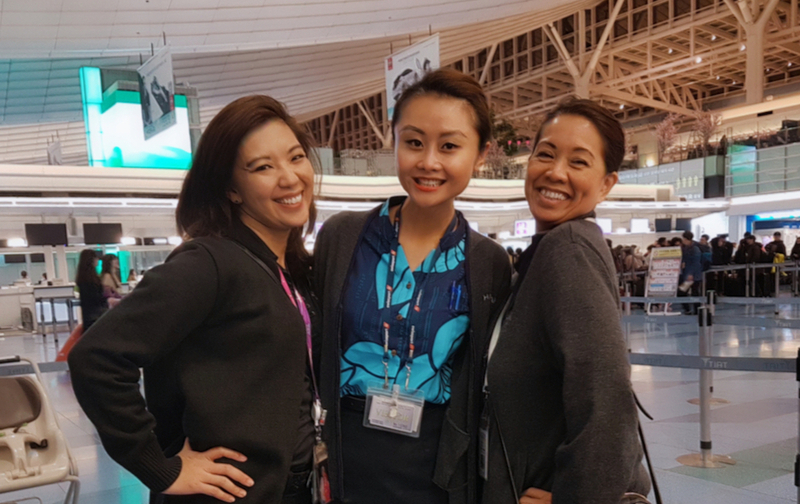 We invited Nien-Tzu (pictured above centre with Hawaiian Airlines trainers Pua and Laezel) to share some insights into her international experience. Nien-Tzu, where are you currently, and what are you up to? I am in Tokyo assisting at Haneda Airport (HND). HND handles 87 Million passengers per year which is slightly bigger than Auckland where I am based with 20 million per year and is double that of Sydney Airport. I am working with the Swissport Japan team (SPJ) which recently started the Hawaiian Airlines Contract at HND. I previously supported Hawaiian Airlines at Auckland Airport and so I can work closely with the departure control team and supervisors and support ticketing and customer service handling. What can you tell us about working at Haneda Airport? Service is very highly valued here in Japan and there is a lot of planning that goes into the preparation and finer details. Team members work extremely hard to achieve the highest level of service and they spend time reflecting on events and how they can ensure everything is 100 percent perfect. There are many interesting cultural differences between working at Haneda and working in Auckland. One thing I’ve found interesting is that before opening check-in, all staff must stand at the front of their counters and bow to the passengers. What are you looking forward to about your time in Japan? I am looking forward to seeing each team member grow in confidence, particularly those new to aviation. Our HND operation is currently small but I also look forward to the growth of clients and new opportunities. I also look forward to catching up with my friends from Japan who I have not seen in a while. Are you enjoying the food? Being a vegetarian, it is a bit challenging sometimes when I can’t read Japanese, but thankfully I have an app that allows me to take photos and translate the words from Japanese to English. Other than that, I absolutely love the foods here, especially the strawberries since they’re in season right now. How are your living arrangements? I have a small apartment while I am here in a suburb close to the airport. There are 28 different types of temples and shrines in the area so I would say I am very blessed (literally!)! My apartment is also close to the Tokyo Skytree building, which is the tallest building in Japan and the famous main entrance to Meji Shrine in Awasaka. Will you have time for sightseeing? If so, what is on your list? This will be my third visit to Japan and there are so many things I have already planned to do and see on my days off. I am looking forward to seeing the Sakura (cherry blossom) which will begin blooming around late March in Tokyo.